Modern office space is at a premium and any cost-conscious business must ensure they make the best use of the space they have before looking for new or larger premises. Often, by simple and inexpensive reorganisation and the creation of a partial open-plan office, additional workspace can be obtained, whilst encouraging collaboration and communication. Consideration must also be given to creating quiet break out and meeting areas that can be used for times when a higher level of privacy is required. And, of course, what sort of colour scheme you would like to see. A decision should never be made solely on price; this is often regretted shortly afterwards. An 'invest-to-save' policy often proves to be more prudent, with savings in annual overheads actually paying for the cost of the refurbishment! 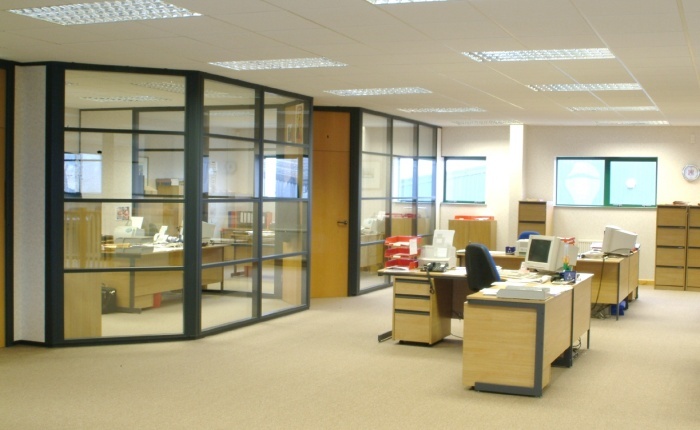 There are a number of excellent, fully relocatable and demountable partitioning systems on the market. These systems have endless options, provide cost-effective alterations and a cheaper whole life investment, and are specifically designed to accommodate the needs of busy and ever-changing office environments. You must make sure any changes will comply with the Building & Fire Regulations, as well as the Disability Discrimination Act (DDA), which places responsibility on employers to ensure their premises and facilities are accessible by physically impaired persons. Failure to ensure compliance with these regulations could be a very expensive mistake! You also need to ensure there is enough ventilation and natural light; to consider general electrical lighting levels; and to provide for interconnected computer & phone systems, means of heating in the winter and cooling in the summer, disabled access, fire protection, etc. Welcoming colour schemes, and uncluttered and practical working conditions help to ensure the most valuable asset of any business, its employees, are comfortable in their surroundings and that visitors are given the right impression of the company. A clean, functional and well-ordered office can help to retain staff, reduce absenteeism, improve the feel good factor and encourage greater productivity. Of equal importance is making the best use of available space for storage of consumables, records and archives. Office storage often can be condensed by up to 50%, or your storage capacity increased by 60%, simply by installing a mobile shelving system; and by up to 75% when using automated vertical or rotating carousels.